The Air Spring mattress brings together the best know-how of Treca Paris at an amizing price. Rest and luxury at everyone's reach. Treca's Air Spring model is a pocket spring mattress that is highly attractive from a price-quality standpoint. Furthermore, this model can be custom designed in three different types of comfort: semi-firm, firm and extra firm. Even if your mattress is more than 120cm wide, you can personalize your side of the bed, that is, you have the option to add this at no extra cost should you wish to have a less firm side for you and a more firm one for her. 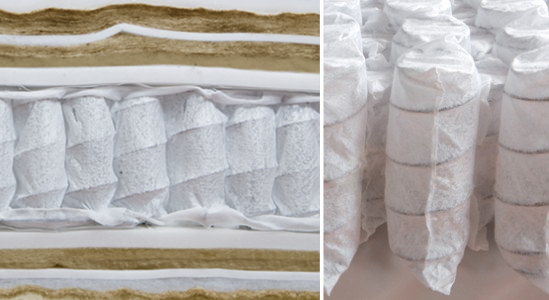 You will find two signature upholstery options differentiating both sides of the bed in your mattress. Treca employs only professional master craftsmen who from the very first minute carefully watch over the entire mattress fabrication process, selecting the best raw materials and ensuring that it comes out perfectly. You also have the option to selct the type of upholstery for your mattress to match your headboard or base... as you wish. CORE: pocket spring core with a spring density of 241 per m2 made with high-elasticity steel and lateral reinforcement. Sealed with a cord. Hand-sewn with inner tufting. HEIGHT: 22 CM +/-1 cm. CENTRAL CORE: Silk and microfiber 900 gr/m2 FINISH: Sealed with cord straps. HEIGHT: 4 cm +/-1 cm. Lo mejor que he podido comprar. Los empleados muy amables y atentos.